With growing numbers of athletes kneeling in protest during the national anthem, the NBA is looking to head off any tensions before its season begins next month. In a letter to players Wednesday, the NBA and the players' union said that "it is really important" that they hear from them. "We will be working with your teams during training camp to get your thoughts and ideas." The protest, which was started by San Francisco 49er quarterback Colin Kaepernick, is meant to raise awareness about racial issues affecting the country. As it's spread, the NBA is faced with the fact that unlike other major sports leagues, it has a rule requiring players to stand during the national anthem. 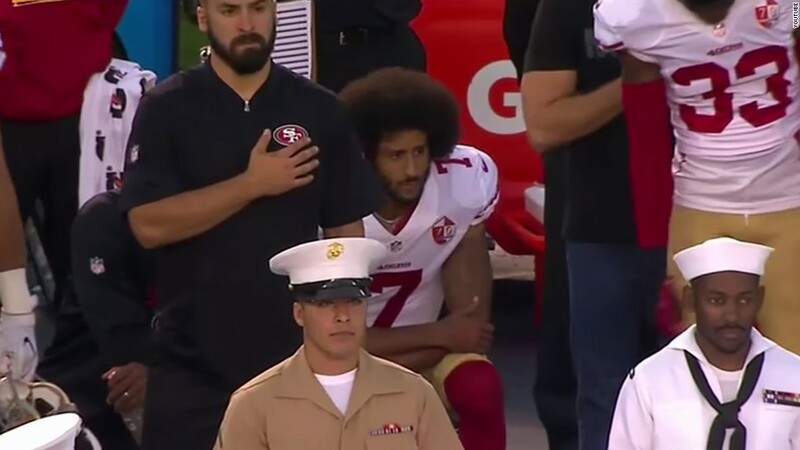 The rule states: "Players, coaches and trainers are to stand and line up in a dignified posture along the sidelines or on the foul line during the playing of the national anthem." In 1996, point guard Mahmoud Abdul-Rauf was suspended for refusing to stand, but he and the NBA worked out a compromise -- Abdul-Rauf would stand but close his eyes and pray silently during the anthem. The letter sent to players on Wednesday said, "Many of you have reached out to us, both to solicit advice on how you can get involved to create positive change and to ask for support as you develop your own efforts." The NBA is arguably the most progressive professional sports league in the country. In July, it announced it was moving its 2017 All-Star Game out of North Carolina over a bathroom law that discriminated against transgender people. It has also been quick to respond to racism and is the only major sport to have a pro league for women. The Oklahoma City Thunder's Victor Oladipo said he assumed the protest would continue in the NBA and the Cleveland Cavaliers' Iman Shumpert initially said in a music video that he would kneel, but then reversed his stance. So far it's unclear whether players will participate in the national anthem protest and whether they will be fined or suspended if they do. The WNBA, which has the same rule, hasn't suspended or fined any of its players for kneeling during the anthem. The entire Indiana Fever team kneeled during a performance of the anthem on Wednesday night and the league's president issued a statement saying she supported their decision to express their views. "Standing for an anthem is a sign of respect and a demonstration of unity across many cultures throughout the world," WNBA President Lisa Borders said. "The call to action is for all of us to invest time and resources to help rebuild and strengthen our communities. And we have been actively working with the players on this next impactful effort." There's no sign the NBA is planning to change its rule. Many of the league's most prominent players have already taken steps to draw attention to the police shootings of black men. Last season, NBA stars like LeBron James, Dwyane Wade and Kobe Bryant wore "I can't breathe" T-shirts in support of the Black Lives Matter movement during pregame warm-ups. At the ESPY Awards in July, James, Wade, Carmelo Anthony and Chris Paul took the stage and addressed the police shootings and racial tension in the U.S.
And Anthony hosted a town hall in South Central Los Angeles over the summer, which brought together members of the community and the LA Police Department to discuss racial issues.